This years Decorex show featured a talk from Colour Hive, a design think tank that explores future themes for interiors. Calling on experts from the different fields of design and materials, Colour Hive attempts to make sense of the current zeitgeist and uses it to predict trends. The talks are a must for interior designers, paint colour and wall paper companies, furniture and accessory manufacturers and even carpet and flooring specialists. Naturally, ani M’s interior designers were there and identified completed projects that already showcase next years four themes: Sentient, Grace, Dream and Punk. This trend is a futuristic look at how humans and technology are evolving side by side. Technology forms an increasingly significant part in our day to day lives so how does that influence our living space? Will advances in robotics change how domestic appliances look in our smart homes? Could synthetic materials on wearables start to resemble skin to feel more comfortable? In practice, the trend features cooler colours, metallic and high-shine materials alongside textiles with technical patterns such as circuit boards and clockwork. What is significant here is the blend of synthetic materials with organic ones. 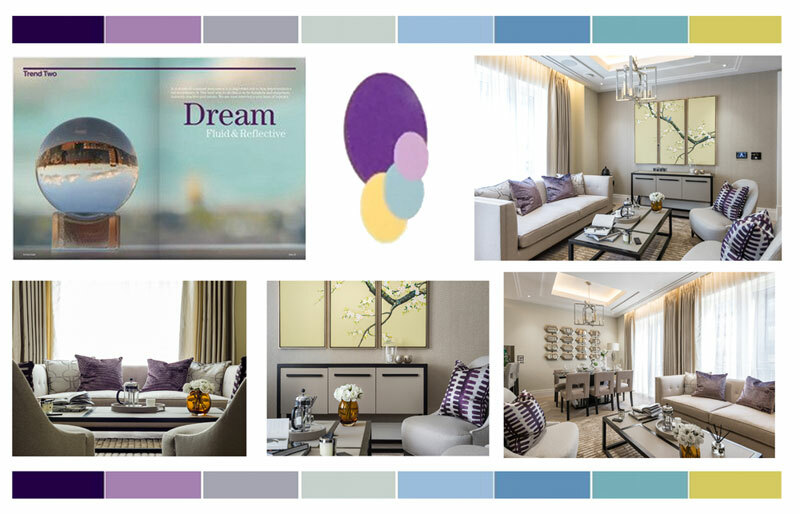 This bespoke interior design project in Kidderpore Green is a great example of the trend. The client requested full decoration, furnishing and window dressings to help its sale. A colour palette of white and grey helped to make the space seem larger, while accents of blue and flashes of gold brought interest and warmth. Organic shapes in the artwork and accessories helped to soften the angular, high-gloss, futuristic-looking furnishings. This attention to detail on textures, fabrics and materials helped the apartment to feel light and airy but with a contemporary twist that made it irresistible to buyers. In marked contrast, Grace has a homely warmth and celebrates quality and the skill of traditional craftsmanship, valuing the time it takes to create something unique. As you would expect, textiles feature heavily because of the time and effort used to make them by hand. The addition of warm, natural hues creates a sort of low-key opulence; it is neutral but still has character. The Riverwalk apartments made great use of this trend. 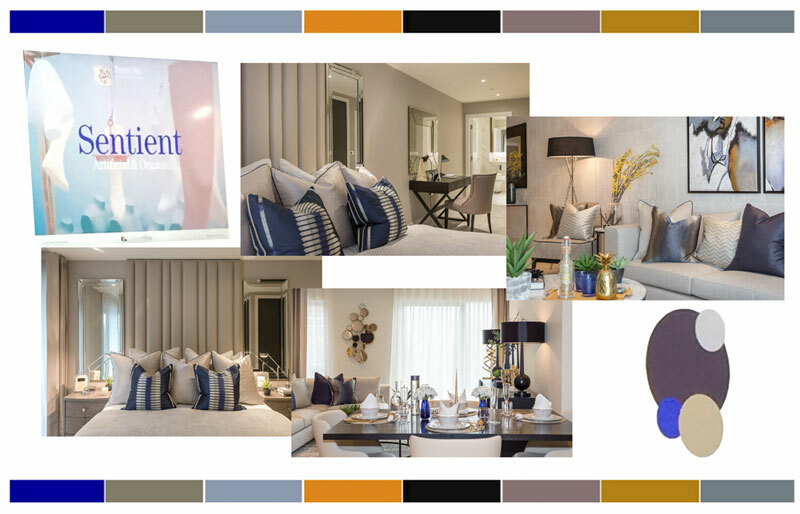 Stunning river views meant that a cool colour scheme could have looked too similar to the blues and greys of the river and a little cold, so the designer cleverly used rich and earthy tones to bring a sense of comfort and luxury. 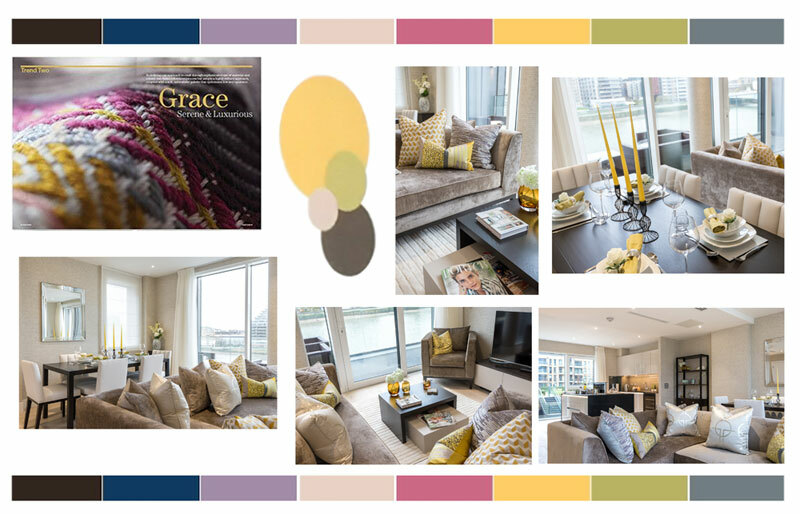 Soothing neutrals of faun and beige are enlivened with yellow and mustard accents on cushions and candles. Continuing the colour scheme, layered soft furnishings in differing patterns help the apartment to feel cosy without feeling cluttered. The versatility of this trend is its simplicity: a few well-chosen, handmade items such as ceramics or textiles will turn a generic space, such as a new-build apartment, into something with personality and appeal. Like Sentient, Dreams theme is to ponder how the living space is changing and how we adapt to the change. Unlike Sentient though, this is one of whimsy, romance, possibility and wonder. Dream reflects how the human imagination enables us to adapt and create new environments. It is natural, organic and gentle. The bespoke design of GMH apartments is a great example of how the natural world was used as inspiration to create a dreamlike interior. These luxury flats had been converted from office space and so the designer had to work hard to create a feeling of home. Ethereal colours such as tones of white and blue evoke clouds, sky and water while the use of taupe and aubergine add a tactile richness. The natural world inspired the artwork and the bespoke accessories, creating an overall effect that is soothing and restful, its a space that instantly feels welcoming. This avant-garde trend celebrates freedom and a rejection of expectation. Its themes are self expression through interior design. It is defiant but not hostile; appreciating that what makes something different is also what makes it beautiful. This trend manifests by layering materials with multiple colours, textures and prints; by over-embellishing features and customising them. It is very playful, encouraging people to reject a traditional view of beauty in favour of a subjective view and what pleases them personally. It uses bright colour palette and its contrasting colours create surprising harmony, apparent in this Renaissance show flat. Strong geometric shapes in bold hues create a show-stopping theme. Order is made more beautiful for the splashes of disorder, the leaf pattern on the scatter cushions in the bedroom, the butterflies taking flight in the kitchen and the billowing grasses on the balcony. The well-chosen furnishings give this apartment a tactile, lived-in and loved individuality. 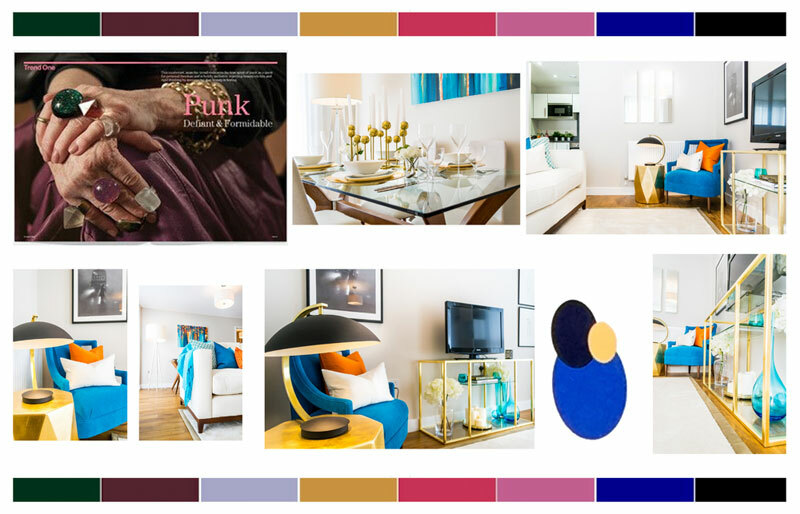 By examining how peoples living spaces are changing and creating looks that celebrate these changes. ani M’s designers can continue to create beautiful and practical interiors and to stay ahead of the trends as these projects demonstrate. If you would like the team to help you realise how your property could be improved, then get in touch with the team today.